This is a similar question to How to turn off the CSI, and turn it back on again, but I'm actually trying to implement the suggestions that were given in that post. 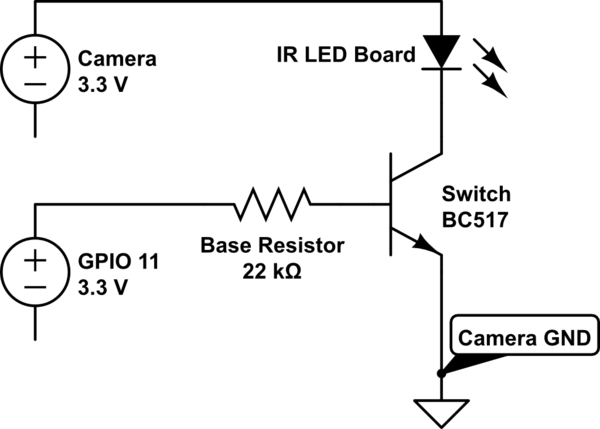 I use the WaveShare RPi IR-CUT Camera which comes with two Infrared LED Boards (B). The LED Boards are directly powered by the camera and there is no way to turn them off. Despite installing heatsinks, the boards/heatsinks get so hot that you cannot touch them anymore. I'm really new to electronics stuff (I've been using Pis for a few years but only for coding) but I tried to build a circuit according to the following schematic, using a transistor switch with the base connected to a GPIO pin. I tried to use a BC517 transistor because of the high gain and high current. I tried various base resistors between 22k and 1k ohm. However, the LED never turned on after setting the GPIO pin to high. Any suggestions? Like I said I'm really new to electronics, so even some tips on how to actually figure out what kind of base resistor I need would be really helpful. From what I've read online it depends on the "load resistance". There are no data sheets available for the IR boards, even the WaveShare support could not provide them. All I know is that the LEDs are 3W and that the camera outputs 3.3V. With that limited knowledge I then tried to calculate/measure the load resistance, but my results suggested using a 22k resistor which did not work. This is much more of an electrical engineering question then a pi question. But you don't need to be using a Darlington pair transistor. You are just switching a small load, which means you are using the transistor in saturation, unlike an amplifier which is what the Darlington pair is normally used for. Also take a look at the voltage drop between collector and emitter for whatever transistor you use, because you are only working with 3.3V, if it has a drop of 0.7V the camera is probably not going to be happy. Darlington transistors do not work well in saturation. When the primary current carrying transistor is saturated, the collector voltage of the input transistor is lower than its emitter, and it no longer provides the desirable gain. In that mode, the input transistor is not much more than a diode in series with the base of the second transistor. That is one of the reasons why it is so hard to get a Darlington into genuine saturation. The current gain of the input transistor helps, nicely, until the collector voltage gets down to about 1V, give or take a little. Then, it turns into mush. Yes, in your post just preceding. That is because of the Darlington pair, for the reason I just described. I would not describe it, however, as "taking voltage away from the device I was switching". Instead, I would say that the (effective) on-resistance simply is not very low. It does, however, provide less voltage drop across the load. Not the answer you're looking for? Browse other questions tagged camera led electronics or ask your own question.